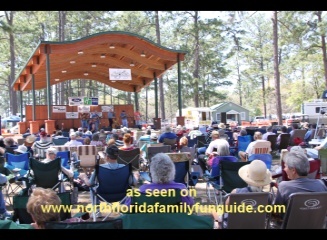 In April of every year, come to Perry, Florida, for some good time family fun at the Florida State Bluegrass Festival. Bring your camper or your tent, and camp under a canopy of tall pine trees and enjoy your stay for the whole 3 day festival. National acts as well as local Florida talent are represented here on an absolutely beautiful stage. Bring your lawn chairs and relax while enjoying some of the very delicious vendor foods. Some of my favorites were the Barbecue, and the Greek foods, wonderful! Arts and crafts, merchandise for sale, and a kiddie area with giant inflatables were part of the festival atmosphere. While there, take a stroll through the Forest Capital State Park Museum, where you can learn all about the Forest industry in Florida, and the importance of the Turpentine trade here. Also, there is a real Cracker home settlement to walk around, and explore. Very interesting learning about how people lived here in Florida in the 1900's. We had a very nice time, and wished we could have stayed longer! This is a great family fun event for the whole family!